Eugene and I had only ever heard of Martha's Vineyard as a summer playground of the rich and very famous. So many tales of happenings that have made newspaper headlines. But we were going to learn more about this extraordinary place. Robin would share his knowledge and be our guide on a fascinating exploration of 'The Vineyard'. His treasure trove of detail and anecdotes would make this adventure all the more remarkable. He rounded us up for an early start for the drive to New Bedford, a city in Bristol County, Massachusetts. Here we booked our tickets on a ferry to Martha's Vineyard. It all seemed so normal for people to be taking a short sea voyage to their jobs or their homes. Apparently 'The Vineyard' is only accessible by sea or air. 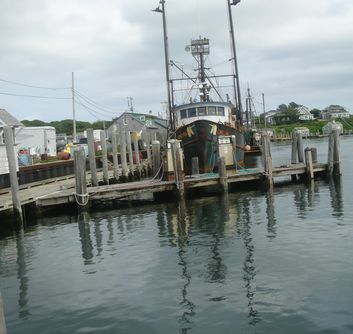 We enjoyed the journey on the calm waters of the Nantucket Sound and landed at Oak Bluffs, a town located in Dukes County, Massachusetts. Eugene and I were never going to get used to the rapidity and ease with which we changed states,counties,cities and towns. Robin hired a car and off we went to explore this quite extraordinary place. What a treat lay in store! This little tourist town opened its arms to show us some amazing sights. A thriving Methodist movement developed there in the 19th century and, with it a camp site for summer meetings. As time passed, wooden walls were added to strengthen the tents and so the cottages evolved into the famous 'Gingerbread Cottages'. They have to be seen to be believed. Lovely bright colours and ornamental mouldings and one could be in toy town. Cheek by jowl with each other and really tiny. I do believe that people were smaller in the 19th century. These have become very expensive real estate and in some cases are still family owned and handed down to future generations. One of these little doll's houses was open to visitors. I felt a bit like Alice In Wonderland entering an enchanted place, or the white rabbit disappearing down a rabbit hole. Minute rooms, with low ceilings and a staircase that could surely have only catered for people with very small feet. On that day, James had not accompanied us. He is a bonny 6ft 4ins and would not have made it through the front door. As ever, food would play an important role in our day. It was approaching lunchtime and Robin suggested that we drive to Edgartown for luncheon. Yippee, food!!! 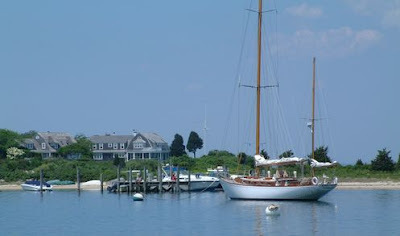 Edgartown was an old whaling port in the 1800's. Ship's captains built marvellous mansions for their families and these grand old mansions and homes are now favoured tourist destinations in the summer. Edgartown incorporates the smaller island of Chappaquiddick which is sometimes connected to the rest of Martha's Vineyard by a barrier beach which can be breached during storms. Gossip swirls around Chappaquiddick as it is the site where Ted Kennedy drove his car into the water as he was crossing a bridge and his companion, Mary Jo Kopechne, was killed. He survived, managing to escape the sinking vehicle. He did not report the incident until the next day! We went to a beach-side restaurant, The Atlantic. Casual, bright and airy and a feeling of always being on holiday. What to eat? As we had long ago succumbed to the allure of the lobster in New England, it would be no contest, we would simply eat more lobster in some form or other. We ordered lobster salads and lobster rolls. Now, lobster rolls must not be misinterpreted as some kind of roll with some lobster. Oh No! Succulent, unctuous lobster dressed in a delicate seafood sauce placed between the sides of a hot dog roll. All this on a plate of salad or fries or whatever took one's fancy. The combination of the soft roll and the firm flesh of the lobster is a triumph. Of course it is eaten with one's fingers and the joy is getting sauce all over over one's face and having an absolute feast. Oh my goodness! My mouth is watering as I write about it. 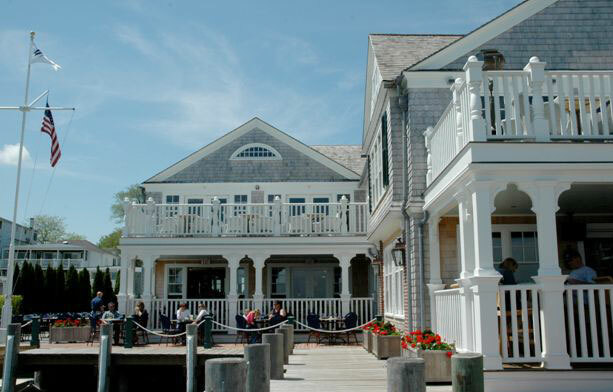 Edgartown was used as the main shooting location for the town of Amity in Steven Spielberg's blockbuster, Jaws. I love movie trivia and found it fascinating recognising landmarks and buildings used in the film. There are all sorts of happenings, some tragic, associated with 'The Vineyard'. On July16 1999, John F. Kennedy, Jr, his wife, Carolyn Bessete and her sister Lauren Bessete were killed when the small plane that he was piloting crashed off the coast of Martha's Vineyard. The Kennedy Curse had struck again and the 'The Vineyard' had carved another notch on it's belt of happenings and history. Native American tribes were living on Martha's Vineyard long before the advent of the colonial era. As time passed, the Colonial English who had purchased the land and the Native Americans came to an amicable arrangement. Ancestors of the early Native Americans still live on 'The Vineyard'. They own tranches of land on the island which today are very, very valuable real estate. Wonderful names such as Wampanoag. Chappaquiddick and Liacoomes are now part of the culture and language of Martha's Vineyard. Time to move on. First a stop to buy delicious ice cream at a place called 'Scoops'. 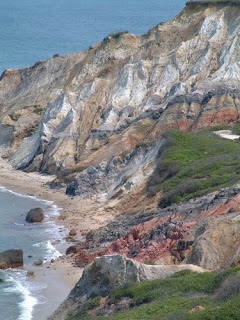 Then off we went across the island to see the famous Gay Head Lighthouse in a town called Aquinnah, the home of the Wampanoag Indian Americans. The Gay Head Light stands boldly atop the famous Gay Head clay cliffs where the clay is a wonderful concoction of colours. All fascinating. 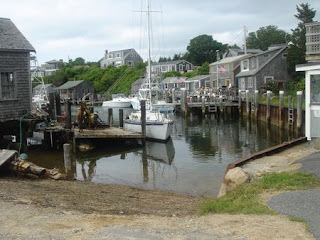 Onwards to a fishing village with the wonderful name, Menemsha. The American Indian words lend such a romance to the lingua franca of the island. This fishing village is perfect with fishermen clomping around in their wellies, a flurry of tugs and fishing vessels, quaint wooden cottages and sea birds wheeling overhead. We were amazed by the shops where one could bring in one's catch and have it cooked while you waited and then sit down outside on a wooden jetty and polish it off. Imagine that! Or, alternatively, you could eat what one of the weathered sea dogs had already carried in and sold to the owners, cooked the way you chose. It was all so different from anything we had ever known and so utterly lovely. Robin urged us back to the car. Time was just racing by and we were on the opposite side of the island from Oak Bluffs where we would catch the ferry back and there was still so much to do. We drove along the island up to a place called Vineyard Haven. 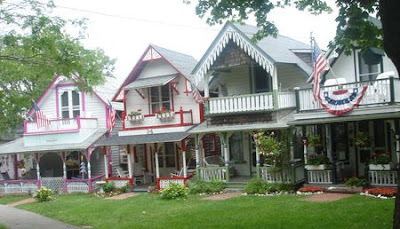 This haven of a place is a community within the town of Tisbury. 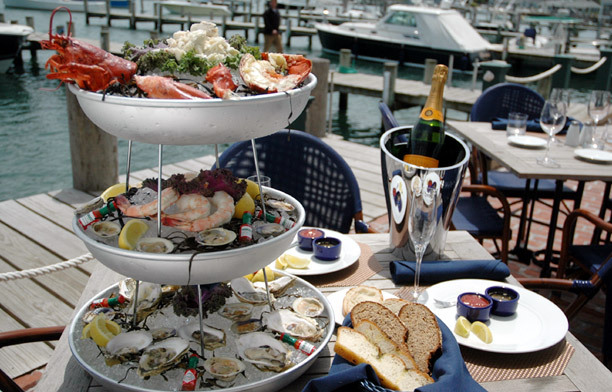 An area of affluence and luxury. Grand houses and mansions, hotels and spas for summer visitors and very beautiful shops. We drove along a private road and saw some of the astonishing summer homes belonging to the very privileged. All this splendour was such a huge contrast after the rustic simplicity of Menemsha, our lovely little fishing village! 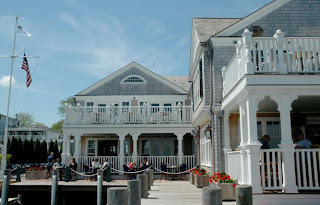 Time to head back to Edgartown and an early supper before we caught the ferry back to the mainland. 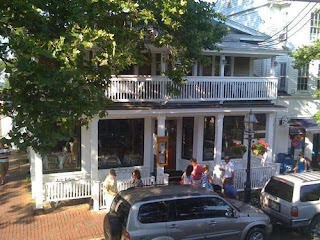 Robin chose a really pretty restaurant, Alchemy Bistro and Bar, a gem of a place. I was enchanted. Lots of white and green with gray wainscoting, lovely old wooden floors and paper covered white table cloths. An opening cut into the ceiling gives a view of the second floor tables. The effect, chic and stylish. We chose to eat a speciality of the house and one of my all time favourites, soft shell crabs. They were fried, cornmeal-dusted and served with lemon risotto, sweet peas and artichokes. The soft shell crabs were delicately flavoured and crunchy and just slipped down one's throat. Oh, what a glorious feast! We washed it down with a crisp and delicious New Zealand Sauvignon Blanc. We had supped royally. Robin certainly earned his stripes that day. It had been a wonderful sojourn of peaceful and serene memory gathering. Incredibly, we would be venturing forth again the following day, but this time it would be to the city of New York, brash, noisy, but always grabbing at a part of one's heart. 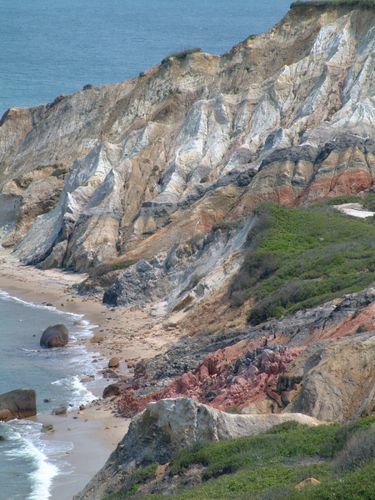 PS: How Did Martha's Vineyard Get Its Name? One of the explorers and the first to leave any account of the island was Bartholomew Gould of Falmouth, England. 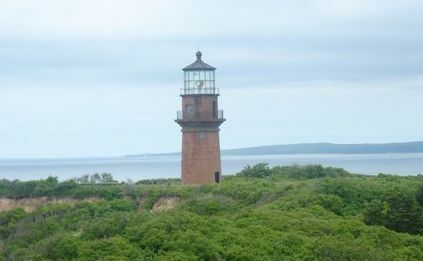 It is thought that he named the island, Martha, either after his mother, Martha, or after his baby daughter Martha who had died. He added the word 'Vineyard' when during his exploration of the island, he came across luxuriant grape vines, lush vegetation and many beautiful lakes and springs of the purest water.